Each year I start several hundred vegetable, herb and flower seedlings. Almost all of them begin on the simple seed starting shelves my husband built over 15 years ago. I wasn't blogging then (I started that around five years ago), so I didn't snap any photos. Heck, I didn't even have a digital camera back then. Photos or no photos, these indoor planting shelves have served me well, and are fairly inexpensive to make. 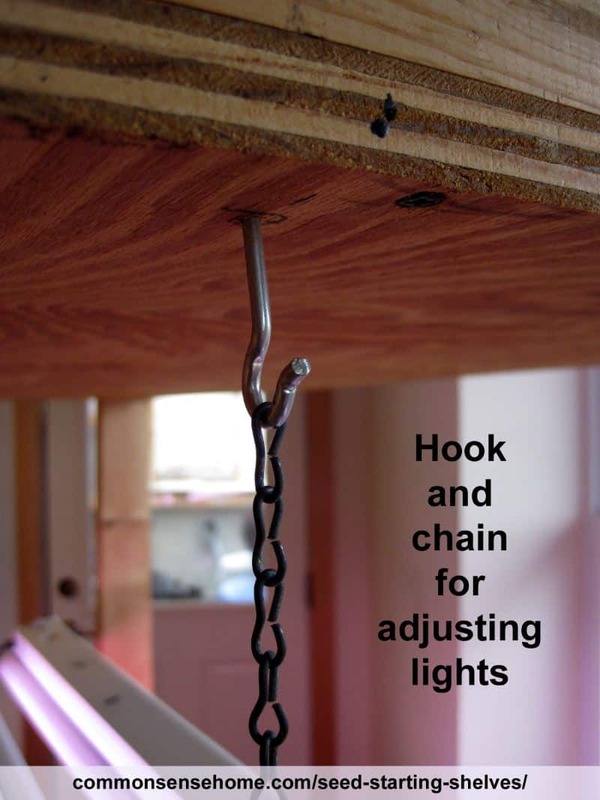 The lights are suspended from chains on hooks, so they can easily be adjusted up or down. 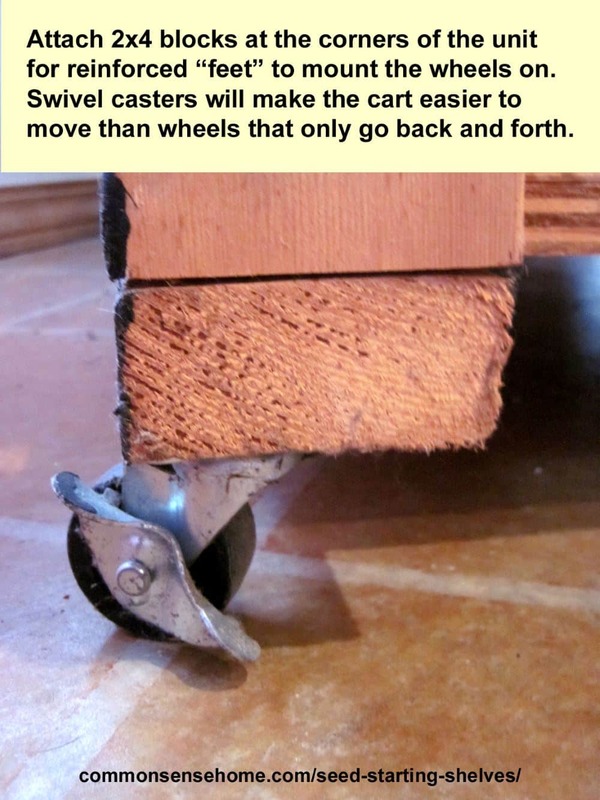 Mounting casters on the bottom makes it a snap to move – even from one house to another. If you use standard 22″x11″ nursery trays with 72 cells per tray, there's room for 576 seedlings under the grow lights, plus an extra 288 seedlings on the top shelf, if you have room for it in your greenhouse, sun room or very well lit room. Cross supports and water proof paint make it sturdy and durable. I pair it up with a fan on a timer, to help keep the seedlings sturdy, and I also use a timer to turn the grow lights off at night. Once the seedlings get bigger, they graduate to the greenhouse or cold frame, and then are hardened off (gently exposed to the elements over several days) and planted out into the garden. 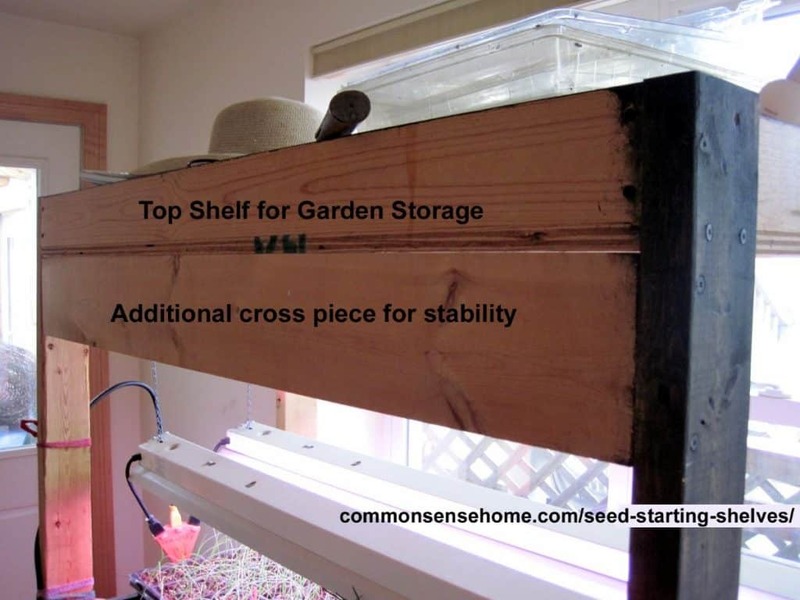 The end result is a seed starting shelving unit that is 4ft 3 inches wide and about 5ft 6inches tall. 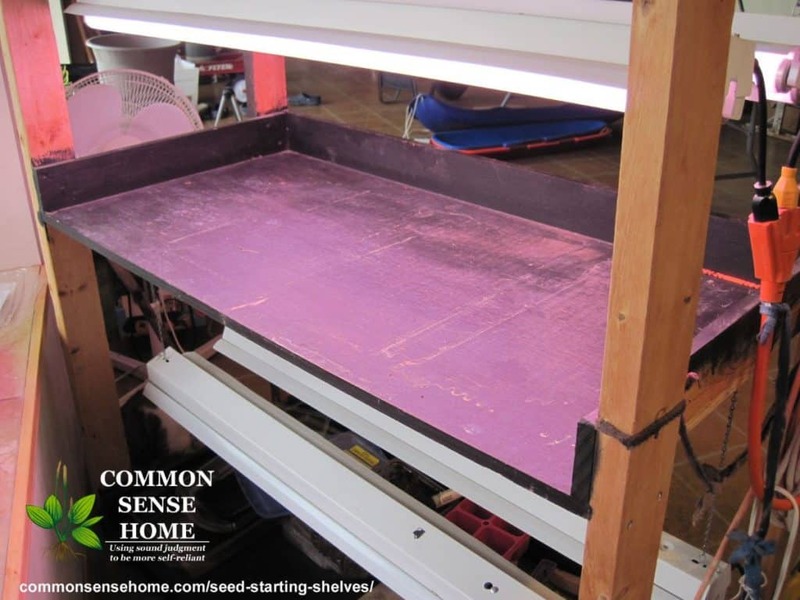 The two lower shelves can have four standard 22”x11” black seed trays, so you can start a total of 8 seed trays under the grow lights. The top shelf could be used for supplies or in a sunroom or brightly lit area. 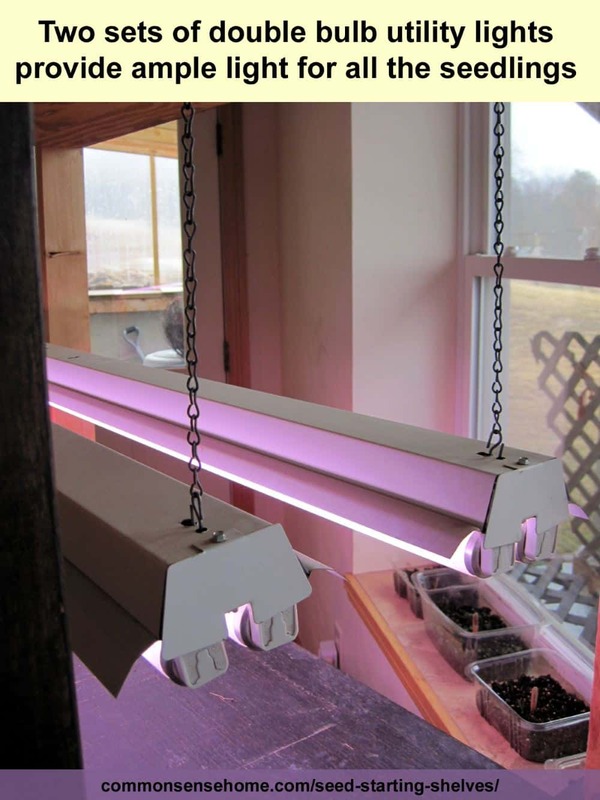 The 4 foot grow lights need small chains so you can raise or lower the lights. Having the entire unit on wheels helps you align it to the sun and move it where you need it. Heavy duty grounded timer(s) for the lights and fan. Most likely you won’t be able to directly purchase the pieces you need above. You can purchase the following and cut the wood up to make the correct pieces noted above. Purchase two good 8ft 1”x4” boards. 1st Board: Rip into 4 boards to act as sides to the shelves, each one needs to be 23 and ¼ inches long this gives you the four of the sides to the shelves. 2nd board: Rip in half giving you two 1×4 4ft boards. Leave one 4ft 1×4 for the 3rd back. Rip the other one again to give you two more 23 and ¼ inches long sides to the shelves. This makes a total of six. Once you have all the materials gathered, it’s time to build the shelves. The project is completed in three sections: first, build each shelf; second, assemble the unit; third, finishing touches. It is easier to build it upside down, so put the smooth side of the shelf facing down. Remember the top will always refer to the smooth side. Remember put the machined side to finished surfaces of the shelf and back wherever possible. It will fit tighter than the side you cut. Add wood glue if you really want this to hold together. Lay one 2ft x 4ft ¾” plywood sheet on the floor or a work bench, smooth side down. Take one of the 1”x4” 4ft long pieces as the “back” and two of the 1”x4” 23 & ¼ inch long pieces as the sides. Put the back in place along the side of the shelf. The side pieces sit flush with the shelf also and are “on end”. This means the shelf should have the 1×4 boards underneath it balanced on end giving you a 3.5” box with one open side. Connect the 1×4 by 4ft piece “back” to the shelf. Pre-drill small holes, then screw in the 1” screws through the shelf into the 1×4 by 4ft back. Place at least 3 screws in the 4ft back piece. The back of the shelf is now connected. Now pre-drill from the 1×4 outside the box, into the end of the 1×4 23” sides. You will need clamps or assistance to keep each corner square. This step forces the sides tight to the back. Use 1” screws to connect the back to the sides. Use the finished sides if possible as they will fit tighter. Next connect the sides to the shelf. 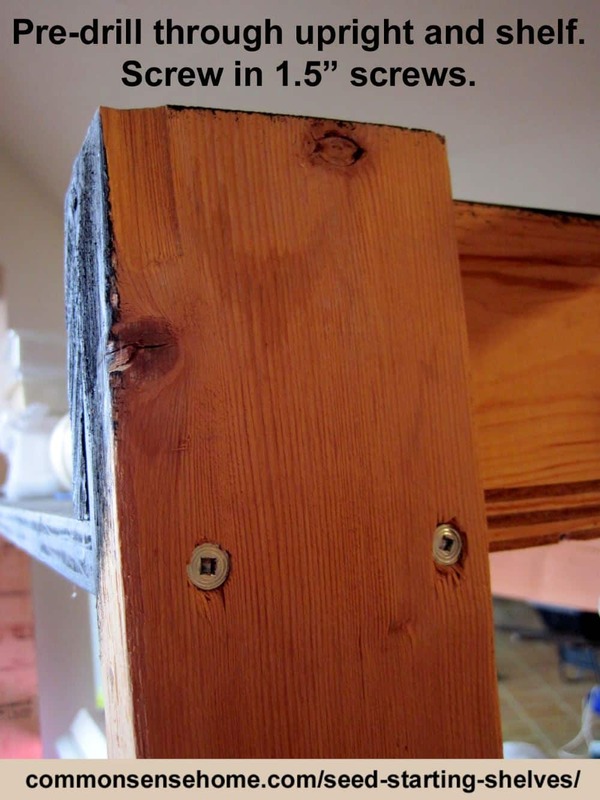 Drill holes through the plywood shelf into the sides, two on each side. Then screw in the 1” screws. Now you have one completed shelf. Now you have 3 shelves. Each shelf is boxed in on three sides and open in the front. This makes the unit sturdy and contains accidental spills. Take all three shelves and lay them so the back of the shelf is on the floor. Spaaace the shelves to be “bottom”, “middle” and “top” with your 2x4s going top to bottom flush. They should be facing up, meaning the back and sides should be lined up with the top. Place two of the four 2x4s on the floor with the 4inch side flush to the shelves. These are the back legs. Note: you may want to use the “small blocks of 2×4” you will use as feet to keep the entire thing off the floor a bit to make screwing and such easier. Measure them so they are equal distances on each side so the unit will be square. Pre-drill through the 2×4 into the shelf base plywood. There are 12 total, with six on each side. Then screw in the 1.5” screws. Pre-drill one screw into the back shelf of each shelf (6 of them, 3 on each side). Screw in the 1” screws. You can see this in the top photo below. Pre-drill two holes into each side of the support panel. Four holes total two on each side. Screw in the 1.5” screws. Take the two remaining 2x4s to make the front legs. You will need help here to either flip the entire unit so the connected 2x4s (back legs) are up. If you do it this way, you can just lay the 2x4s on the floor on top of your small supports. Alternately you will need to clamp them in the air. Now you can put the 2×4 feet on the bottom of the shelves. These line up with the 2×4 supports and are screwed from below into the 2×4 into the top. Add wheels. Additional cross support mentioned in step 4 above. Pre-drill holes, then drive in your screws. Front legs will have two screws per shelf, back legs will have three screws per shelf. Screw in the 8 hooks to hang the 4ft grow lights (place the hooks based on the mounts on the plant lights of your choice). Consider connecting an electrical power strip to the exterior of 2x4s on the power side of the electrical cords for the lights. Note: Light output from fluorescent bulbs will decrease over time. I've had the same bulbs since these shelves were first built, but I noticed the plants are reaching for the light more in recent years. I've been eying up a new LED grow light because of the lower energy use and lack of mercury concerns, but haven't taken the plunge yet. The reviews of them online appear mixed. This year I've started using Espoma organic seed starting mix, in part because it contains beneficial mycorrhizae, which inoculate the seedlings with the microorganisms they need to grow and thrive. Think “plant probiotics”. So far, so good. I am not a fan of Miracle Gro products. They have killed and stunted my seedlings in the past. This is awesome Laurie. Thanks for the start seeds plans. 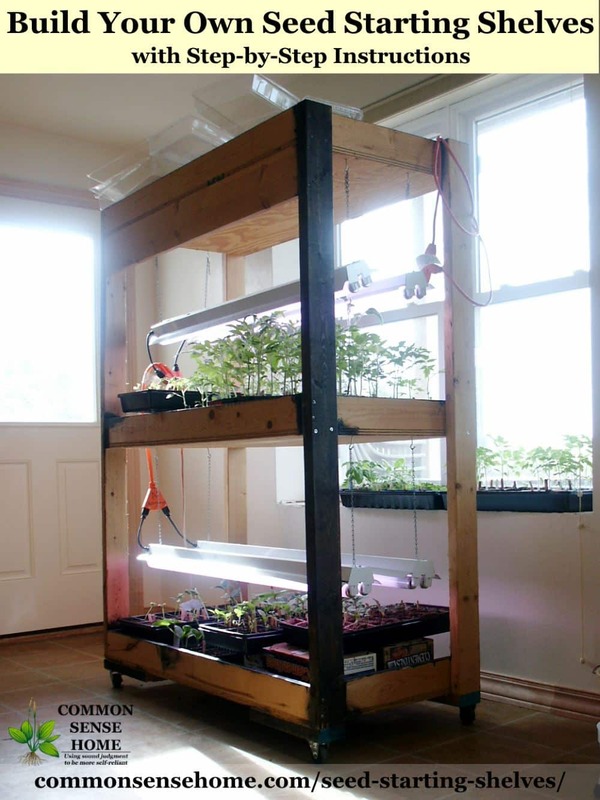 I also have a similar homemade growing rack (5’x 6’x 24″ ). The frame itself (4 corners) was built with 2×4’s & the shelf frames were made with 2×2’s & covered with hardware cloth to help with air circulation. I also keep a small fan running & use a heat mat on one shelf to get the seedlings started. During winter I use the rack for growing Micro Greens. I have got to get Eddie to build me at least one of these! Thanks for detailed instructions! I have to make one of these! Thanks! When do you start you seeds? am I way behind already? It’ll be a bit yet, but some seed varieties sell out early, so I don’t want to order late this year. The bulk of my seed starting takes place in March and April, but some seeds like onions and certain flowers and herbs I strt in late February. There’s a printable seed starting calendar on the site to help you plan out spring planting, inside and out. Black paint will absorb light and heat more readily than other colors, but it shouldn’t make a huge difference. Thanks for this I will be putting my husband to work this weekend! Question about the lights and fan. To make the plants hardy how long do you run the fan and when do you start this process? How much light /how long would you say is needed when it’s not natural sunlight? I have my lights on a timer and have them “on” from around 6 am to 10 pm. The fan I don’t have a set system for. When the plants are smaller, I just try to brush them when I’m in the area. When they’re taller, I might set the fan to run for an hour twice a day. Many commercial greenhouses seem to keep their fans running all the time. Thanks for all the important information! I will try to make one of these this summer for next years garden. Such a great shelf and so easy to make ( I did it high off marijuana) .